Peter Orner is an American writer and the author of four books of fiction. 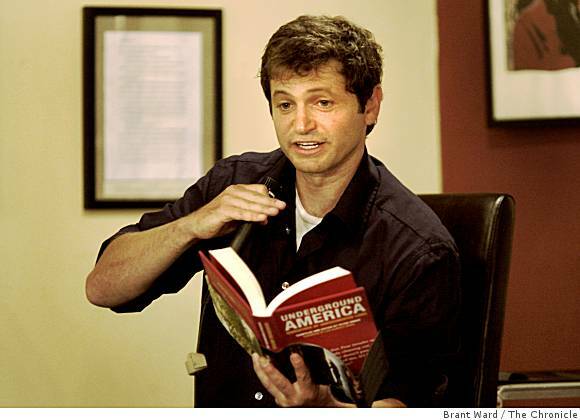 His first book, Esther Stories was a Finalist for the Pen Hemingway Award and Winner of the Rome Prize from the American Academy of Arts and Letters, and has been recently re-issued with a new introduction by Marilynne Robinson. His novel, The Second Coming of Mavala Shikongo, set in Namibia, has been translated widely, including in German by Hanser. Love and Shame and Love, Orner’s second novel, has also recently been published in German by Hanser. 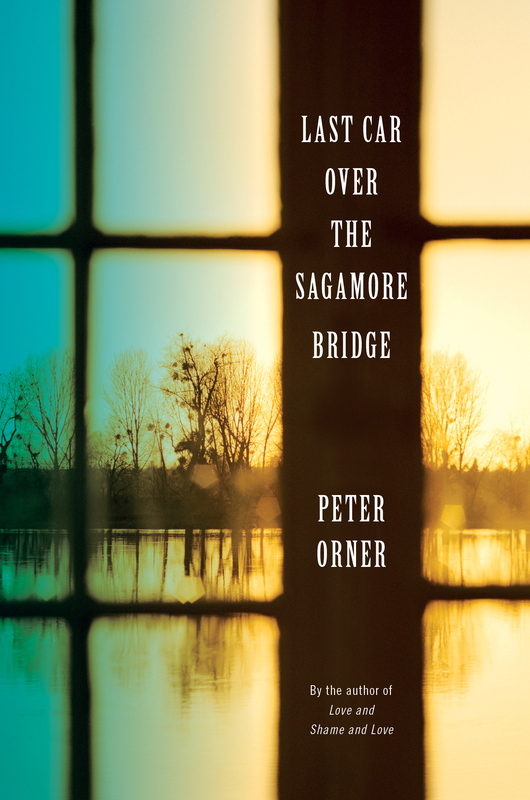 Orner’s most recent book, a collection of stories, Last Car Over the Sagamore Bridge was named a New York Times Editor’s Choice Book last year. Orner has also published two books of non-fiction, a book on immigration in the U.S. and another about political violence in Zimbabwe. Orner is a Guggenheim Fellowship recipient, and has taught at The University of Iowa Writers’ Workshop, Bard College, The University of Montana, and teaches in the MFA Program at San Francisco State University. He lives in Bolinas, California where he is a proud member of the Bolinas Volunteer Fire Department. The retreat offers the opportunity for writers of all genres and levels to work alongside award-winning authors & editors like Peter Orner (fiction, nonfiction), Rita Banerjee (poetry, fiction), Diana Norma Szkoloyai (poetry, nonfiction), and Jessica Reidy (fiction, poetry). Yoga will be led by Elissa Lewis. 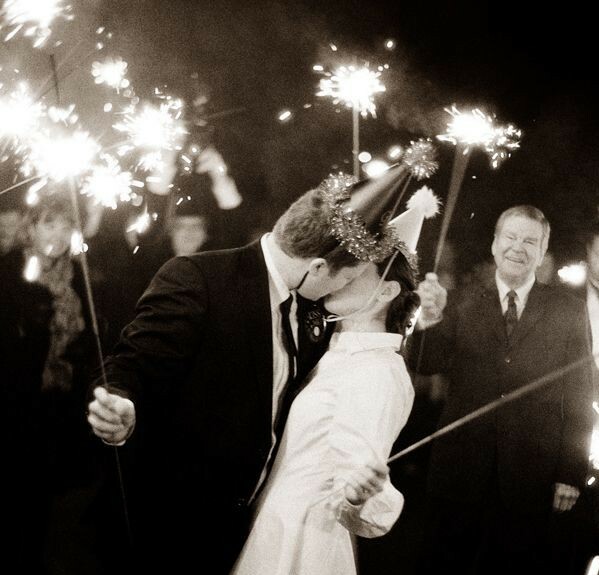 The retreat will take place from August 3-10, 2015. The cost of the retreat is $2950, which includes lodging, craft of writing seminars and writing workshops, yoga classes, room cleaning, and breakfast. Optional add-ons include reiki healing and aromatherapy sessions. If you’d like to join us in Granada, please apply online at cww.submittable.com by June 15, 2015, and include a $5 application screening fee and a 5-page writing sample. (Due to limited seats, early applications are encouraged, but check for rolling admission after deadline, depending on availability). 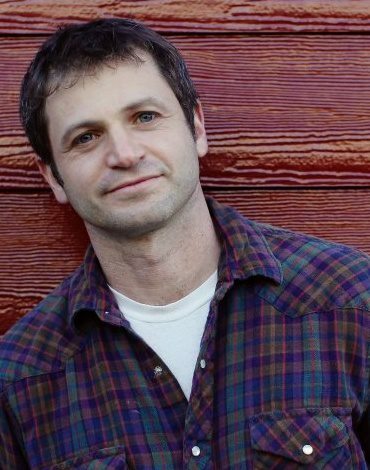 Peter Orner Chicago born Peter Orner’s fiction and non-fiction has appeared in the New York Times, the Atlantic Monthly, Granta, The Paris Review, McSweeney’s, The Southern Review, The Forward, The San Francisco Chronicle,andPloughshares. Stories have been anthologized in Best American Stories and twice won a Pushcart Prize. 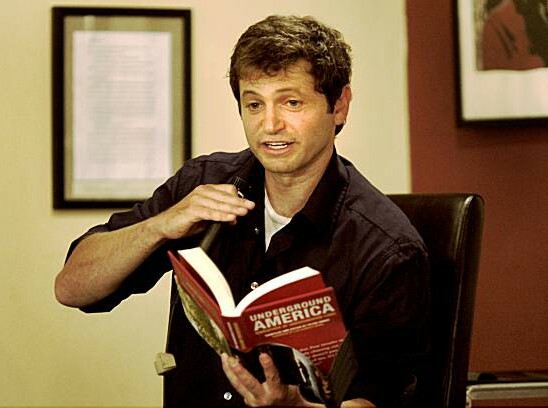 Orner was awarded a Guggenheim Fellowship (2006), as well as the two-year Lannan Foundation Literary Fellowship (2007-2008). A film version of one of Orner’s stories, “The Raft” with a screenplay by Orner and the film’s director, Rob Jones, is currently in production and stars Ed Asner. 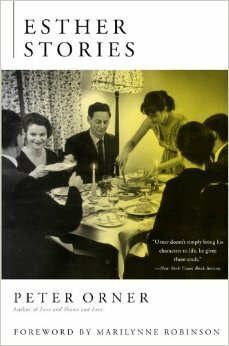 Esther Stories (Houghton Mifflin/​ Mariner, 2001) was awarded the Rome Prize from the American Academy of Arts and Letters, the Goldberg Prize for Jewish Fiction, and was a Finalist for the Pen Hemingway Award and the New York Public Library’s Young Lions Award. Esther Stories was a 2001 New York Times Notable Book. Rita Banerjee is a writer, and received her PhD in Comparative Literature from Harvard University. She holds an MFA in Poetry and her writing has been published in Poets for Living Waters, The New Renaissance, The Fiction Project, Jaggery, The Crab Creek Review, The Dudley Review, Objet d’Art, Vox Populi, Dr. Hurley’s Snake-Oil Cure, andChrysanthemumamong other journals. Her first collection of poems,Cracklers at Night, was published by Finishing Line Press in 2010 and received First Honorable Mention for Best Poetry Book at the 2011-2012 Los Angeles Book Festival. Her novella, A Night with Kali, was digitized by the Brooklyn Art-house Co-op in 2011. She is a co-director of the Cambridge Writers’ Workshop, and her writing has been recently featured onHER KIND by VIDA: Women in Literary Arts and on KBOO Radio’s APA Compass in Portland, Oregon. Diana Norma Szkoloyai is author of the poetry books Roses in the Snow and Parallel Sparrows(Finishing Line Press). Her writing and hybrid art have appeared in Lyre Lyre, Dr. Hurley’s Snake Oil Cure, The Fiction Project, Teachers as Writers, Polarity, The Boston Globe, The Dudley Review, Up the Staircase, Area Zinc Art Magazine, Belltower & the Beach, andHuman Rights News. Founding Literary Arts Director of Chagall Performance Art Collaborative and co-director of the Cambridge Writer’s Workshop, she holds an Ed.M from Harvard and an M.A. in French Literature from the University of Connecticut. Extended Deadline – Apply to the CWW Summer Writing Retreat in Granada, Andalucía, Spain by May 1! 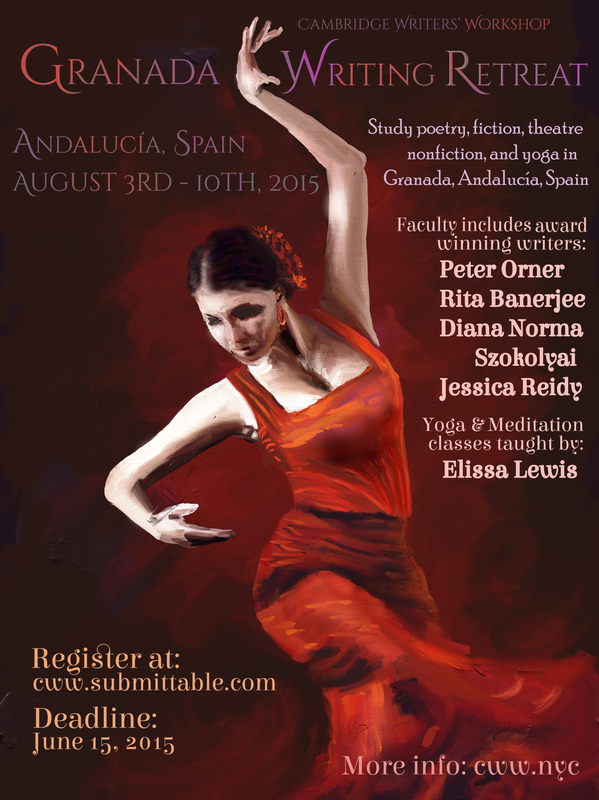 Join the Cambridge Writers’ Workshop on our summer writing & yoga retreat to Granada, Spain. Located at the foot of the Sierra Nevada mountains in Andalucía, Granada is one of the gems of Spain and has inspired writers from Washington Irving to Salman Rushdie to Ali Smith. Indulge in delicious Andalucían cuisine and traditional Arab baths. Work on your existing manuscript, or look to the beauty and warmth of Granada to inspire all-new projects. The retreat offers the opportunity for writers of all genres and levels to work alongside award-winning authors & editors like Peter Orner (fiction, nonfiction),Rita Banerjee (poetry, fiction), Diana Norma Szkoloyai (poetry, nonfiction), Jessica Reidy (fiction, poetry) and Elissa Lewis (yoga, meditation) to hone their craft and expand their writing skills, while working on new or existing projects. If you’d like to join us in Granada, please apply online at cww.submittable.comby May 1, 2015, and include a $5 application screening fee and a 5-page writing sample. (Due to limited seats, early applications are encouraged, but check for rolling admission after deadline, depending on availability). Posted on April 16, 2015 by Katy M.
Register for CWW Summer Writing Retreat in Granada, Andalucía, Spain by May 1! If you’d like to join us in Granada, please apply online at cww.submittable.com by May 1, 2015, and include $5 application screening fee and a 5-page writing sample. (Due to limited seats, early applications are encouraged, but check for rolling admission after deadline, depending on availability).